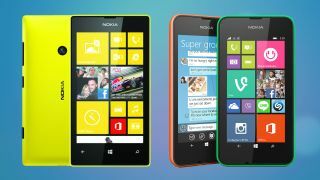 Can Nokia and Microsoft improve on one of 2013's biggest hits? We were really impressed by the Nokia Lumia 520, but it's time for an update – and it looks like the all-new Lumia 530 offers even more for less. The budget end of the market has grown increasingly fierce in recent months as decent Android smartphones like the Moto E and the EE Kestrel have hit the high street, but making affordable phones without scrimping on quality has always been a strong suit for Nokia. So how does the 530 measure up against its predecessor? Let's find out. Nokia has suggested a price of €85 (around £70, $115, AU$120) "before taxes and subsidies" for the Lumia 530, which is impressively cheap for a phone of this calibre. The Lumia 520 is around £70 on a PAYG deal and you can get a SIM free 520 for about £80, down from £100. If you couldn't work it out, it's already on sale. Has been for a while, actually. The Lumia 530 is coming in even cheaper in August, despite a bump in specs. At £70 it will be undercutting virtually every decent smartphone currently available. The angular design of the 520 has been softened off slightly in the 530 which has more rounded corners. It's almost exactly the same size though, as Microsoft/Nokia shaved a tiny amount off the height and width, but the 530 is chubbier than its prequel at 11.7mm and 129g versus the 520 at 9.9mm and 124g. Nokia's love of brightly coloured plastics continues unabated, but there are white and dark grey options alongside the green and orange. Just like the 520 you can purchase extra shells if you want to switch colours. Both phones have a 4-inch display, but the 530 benefits from a slight bump in screen resolution up to 854 x 480 pixels. That gives it a slightly higher 245ppi, so it will be a touch sharper than the 520, which was 800 x 480 pixels and 233ppi, but you'll have to look very closely to see a difference. The Lumia 520 had a 1.2GHz dual-core processor, the Qualcomm Snapdragon MSM8227. The Lumia 530 boasts the newer and more powerful Qualcomm Snapdragon 200, which is a 1.2GHz quad-core processor, and should give more than enough grunt for anything you'd expect to do on a bottom-of-the-range handset. Both are backed by 512MB of RAM, but the internal storage on the 530 has actually dropped to 4GB compared to the 8GB that was available in the 520. By way of compensation the 530 can take microSD cards up to 128GB in size, where the 520 was limited to 64GB cards. Rated at 1430mAh the battery in the 520 is generally enough to see you through the day. Perhaps that's why Nokia hasn't seen fit to change it, because the 530 has exactly the same battery inside - plus you can switch it out for another one if you're into that sort of thing. The new processor may be slightly more efficient, enabling to squeeze a little more out of that battery, but we'll find out when we do a full review. If you were hoping for an improved camera or a front-facing snapper then get ready to be disappointed. The 530 has exactly the same 5MP camera as the 520 with no flash. There's no dedicated camera for selfies, but the GlamMe app lets you use voice control to snap a shot with the main camera. We weren't overly impressed with the camera in the original Lumia 520, but then again, if it does anything more than sketch a vague picture of what you're looking at, it's a good enough snapper for the price in our eyes. The 520 was released with Windows Phone 8 and it is upgradeable to Windows Phone 8.1. The 530 will launch running Windows Phone 8.1 right out of the box and should there ever be a specs limit on future Windows Phone upgrades (Windows Phone 9, for instance) the newer model with a boosted engine should be in line to get them where older models could be in danger of missing out. There really aren't any other differences to speak of. Nokia has managed to improve slightly on the 520, at least on paper, and shave something off the price, a neat trick.